David Murdoch, Ewan MacDonald, Peter Smith and Euan Byers had made it through to the semi final to meet Germany. They had lost to Germany in the opening round but this was the semi final. Team Murdoch looked up for game, Germany had last stone and blanked the first. In end two Scotland lay two shots, Andy Kapp for Germany was heavy with his last stone, it slipped to the back of the house, Scotland stole two. Germany got two back in the fifth and the sixth end was the winning end, David Murdoch had a hit to lie two, the bonus came when he also managed to move a German stone about an inch, enough to lie three shots. A mishit by Germany in the seventh allowed Scotland to steal a single. End eight, Andy Kapp played a hit with his last stone, he hit and rolled, Dor Borthwick stepped in to do the measure, Scotland lay shot and Germany conceded, final score 2/7. Tomorrow Scotland meet Norway in a re run of the 2007 final. Top: David Murdoch and Andy Kapp in the semifinal. 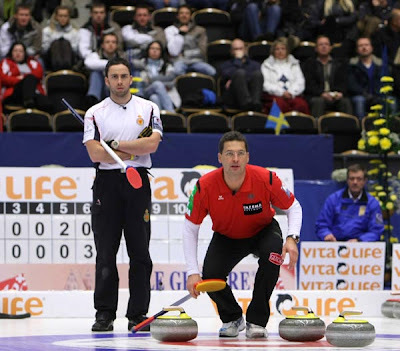 Photo courtesy of the World Curling Federation. A wee note of thanks from the Editor to two members of the Scottish Curler team who are in O'Vik. 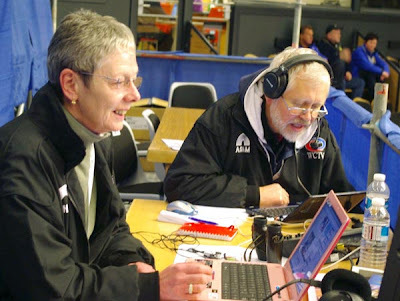 Here are Christine and Hugh Stewart at work on the media bench. Photo courtesy of Wim Neeleman. And well done to Team Murdoch! It was great being able to watch the semifinal on the Eurosport player. What's in store for the weekend?